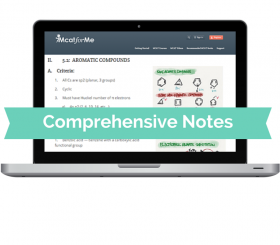 The following are free MCAT flashcards and free MCAT notes that cover all 4 subjects of the MCAT: biology, organic chemistry, general chemistry and physics. Please select from the following categories to view the list of flashcards or notes within each subject. The Free MCAT flashcards and Free MCAT notes should be used when studying for the MCAT in conjunction our Free MCAT course.